Nothing ties a garden together quite as nicely as a bird bath. Birds are naturally attracted to the sounds of running water, and you’ll be surprised by how intriguing watching the variety and number of feathery little guests paying you a visit can be. But while bird bath pumps can be electrically powered, it isn’t devoid of drawbacks. Not only are electrical installations more expensive, demanding to maintain and limiting in terms of where your bird bath can be located, they can also pose electrocution risks to the birds or the flora and fauna of your garden. But never fear – we have a simple, no fuss solution for this predicament: solar power. We’ve shortlisted the best sun-fuelled water pumps you can slot into your bird bath, with little to no hassle. This solar-panelled pump looks its part, a minimalistic but aesthetically designed device which floats on water, and only requires sunlight to operate. Without the fuss of connecting wires and plugs or changing batteries, all you need to do is ensure the solar panels are directly exposed to sunlight, without shadow, to capture the solar energy and power the pump, with a maximum flow capacity of 40 gallons per hour. A tip is to anchor the pump with a bed of decorative rocks or pebbles at the bath-bed, to keep the pump from tipping water out and emptying the bath. To keep the motor from burning out, it’s also important to make sure the bath is properly filled – the minimum recommended depth is about 1 ¾ inches. Both the bath and pump also need to be regularly cleared of debris or bird waste, to prevent the fountain from clogging up and recycling dirty water. If you’re going for a wider bird bath or a garden fountain, this is the heavy-duty pump for the job. With a spray trajectory of maximum 45 centimeters, the pump promises a lifetime of 10,000 hours, making it a durable option to select, if properly maintained and looked after. The pump itself is submerged under water, while the external solar panel component is connected to the pump via a cable to feed it power. Its usage is also versatile, making it perfect for setting up a temporary pool or fountain, or as a sprinkler to keep your plants and lawn well hydrated. Available with a set of attachments that let you control the height, lift and spray of your water pump, these detachable components are easy to switch around and remove for cleaning. As the pump doesn’t store power, it only works when directly placed under sunshine – thus its operability is affected by shifts in the weather, seasonal changes, and so on. To ensure longevity, it’s better to keep the pump itself fully submerged under water so the motor doesn’t run out, and store it safely away when not in use. 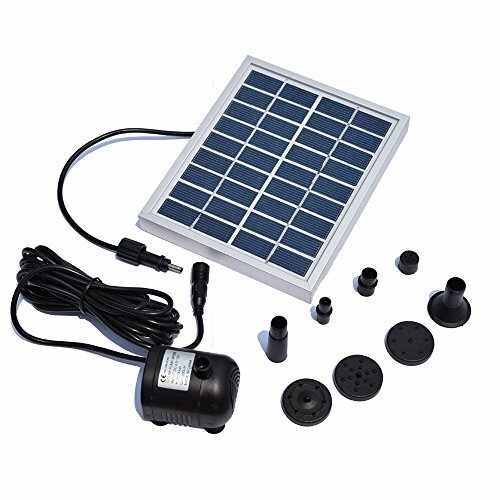 With a 3 meter cable to plug into the separately included solar panel, it’s important to connect the pump to its solar battery only after submerging the motor in the water, as it will turn on immediately upon exposure to sunlight like the other options on this list. With a maximum spray height of 60 cm, water lift of 1.2 meters and a flow rate of 150 liters per hour, this pump comes with attachments you can fix to the nozzle to control the spray, as well as the choice to forgo an attachment altogether so the water of the bird bath bubbles instead of splashing. If you live in an area that only receives mild sunlight, this is more an ideal choice for a solar-powered water pump than the floating variations, which require more direct sunlight. Sturdily built with a glass and metal structure for the solar panels, you can also choose to purchase this pump with a backup battery to replace the original one once it’s worn down. If you’re looking to invest in a bird bath itself, rather than just a pump, why not pick one which already comes with a perfectly pragmatic, convenient solar-powered pump? 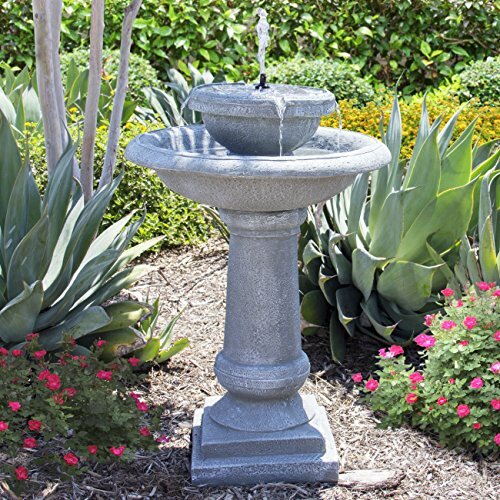 This 2-tiered, concrete bird bath, reinforced with glass fiber and a weather-resistant slate grey finish, is the perfect classic decorative piece to have in your garden, with a built-in motor to run water and accommodate twice as many birds. The best thing about this fountain is that even when the motor is off, the battery will continue to charge and store solar power if under sunlight, with an operational capacity of six hours when fully charged. This does away with the inconvenience of your motor only running when there is sunlight. 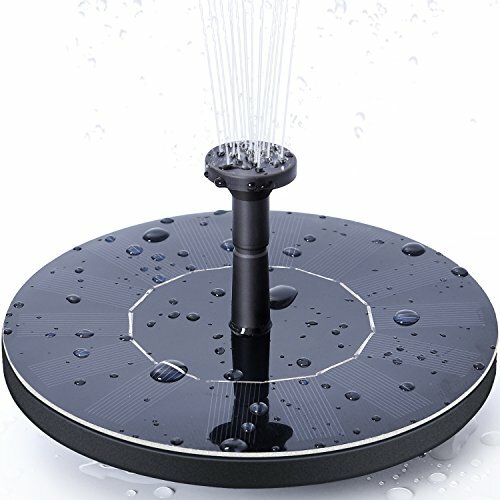 Accompanied with built-in LED lights, this bird bath doubles as a beautiful night-time fountain, running on the charge it amassed during the day. The bath also comes with an in-built filter, pumping recycled, clean water via the concealed motor. The filter is also easy to hose down, to keep the pump from getting clogged up. The fountain comes with four different attachments to let you control the height and width of the fountain spray to your liking. Solar pumps are the perfect eco-friendly solutions if you elect to have a running bird bath in your garden. Flowing water attracts more birds, and also prevents an uptick of mold and mosquitoes, common around bodies of still water. Arguably the most important aspect to consider when picking a bird bath pump is vertical lift and water flow rates. The maximum lift of a water pump indicates how high the pump can push water, while flow rates indicate the volume of water that can be pumped per hour. If you have a deep bird bath or are looking for a broader or higher fountain spray, these are critical to consider when trying to pick a pump of the right capacity. The ideal solar pump depends in part also on the amount of sunlight your lawn or garden receives. 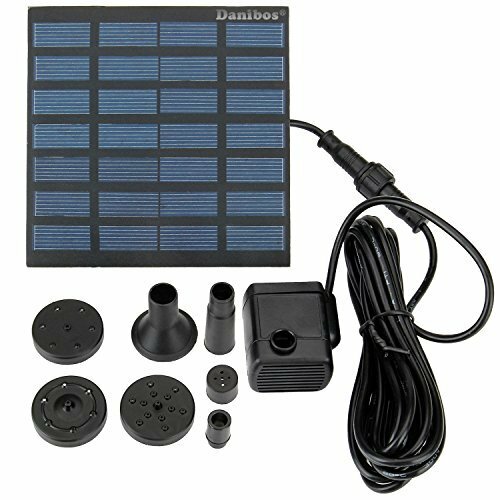 For mildly sunny areas, a pump which can be connected to an external solar panel and located directly under the sun is the best choice. It’s also pragmatic to look for a pump with detachable parts, such as the nozzle through which the water is pumped. Bird baths tend to gather debris, brought by the birds themselves or simply accumulated from the surroundings. If not properly cleaned, this can clog up the pump and put pressure on the motor. Detachable and simple-to-install pumps also make it easier to replace the bird bath water, which is a must if your pump doesn’t come with an in-built filter or recycling system – dirty water can spawn algae if left still, and is harmful to the birds bathing and drinking from it too. Deeper bird baths are generally preferred to shallow ones when it comes to solar powered bird baths – not only does running water evaporate faster, having a deeper bath ensures your pump is constantly submerged and doesn’t run the risk of frying out. Starproductreview.com is a participant in the Amazon Services LLC Associates Program, an affiliate advertising program designed to provide a means for sites to earn advertising fees by advertising and linking to amazon.com.